Certain online printing companies offer free printing templates that permit you to design your piece online. While their templates and design space is free, many people overlook the fact that the creative they slaved over doesn't really belong to them, it belongs to the online printer. Why? Because your design resides on their computer and their "fee" for using their computer and software is "you must print with me". So much for "free". For some, this restriction is very painful... below is an email we received from Nicole who got trapped by an online print shop. She designed her brochure from an online printing company that offered free brochure templates and then got an unpleasant surprise. Poor Nicole. Because she didn't "own" the design she created she ended up having to pay $1,000 MORE for her brochure printing. Very painful. So what did we learn? 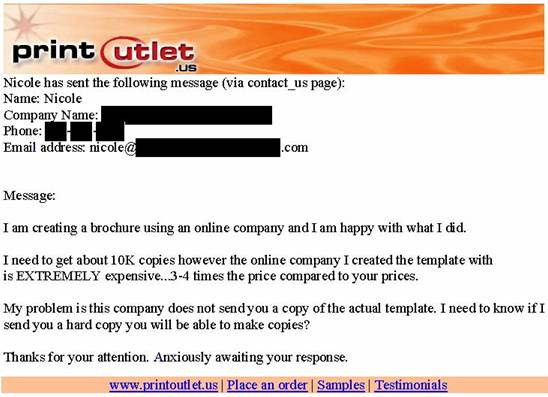 When choosing an online printer who offers free flyer templates, please be careful. If you want to "own" your design, choose an online printer where you can download the template onto your computer, then design away. With everything on YOUR computer you KNOW it's yours. PrintOutlet offers free postcard templates, free business card templates, brochure templates for free and flyer templates for free all downloadable to your computer, in every major design software. Or if you'd rather have one of our in-house professionals design your print, this is how we do it at PrintOutlet. You call or email us asking for design service and one of our in-house designers gets your details. We provide you with an estimate of what it will cost (usually around $100 for a standard 3 fold brochure). Our in-house designer creates your print and sends you a draft for your comments. If you like what you see you approve the draft otherwise you ask for changes. We make your changes and send you another draft until you are satisfied (up to 3 reiterations are free). Once you approve your design we send you a CD of the working file and you're free to print wherever you wish. You now OWN the file...it's yours. It's that simple. When it comes time to print your job, we hope you'll print with us but if for any reason you choose not to thats fine, you have your print ready file in hand and can go anywhere you wish. Give us a call when you need design services...I'm sure Nicole wished she had.